I've been asked numerous times by other photographers what system to use? Certainly for the smaller M4/3 Olympus cameras. Several things come into factor of course and quality is most important. Secondly cost, for most togs I know, photography is just a hobby and doesn't bring in any major income so the system can't be expensive. So who to pick? Cokin, Lee Filters, Nisi, Tiffin, B+W, Gobe, Formatt Hitech, Hoya or Zomei are to just name a few and I haven't even scratched the surface on the cheaper brands yet. Is it any wonder togs get confused as to what brand to invest into? You can get screw threads from as little as £2 on Amazon right up to the monsters of £150+ from the top dogs. Of course the more you pay, the better the quality. Well not always true. Speaking from experience with film, IR and cheap filters, Cokin and Hoya have been interesting to say the least. The polariser is brilliant, can't fault it, the resin filters are okay. You can get some interesting colour distortions from time-to-time and I wouldn't recommend stacking this system but by god is the holder terrible! A cheap, flimsy plastic cover that you have to pinch and push the filters to slot in, I've lost count how many times I've broken polarisers on this system. Here comes the next problem, well not a problem more its very funny. Have you ever seen a filter larger than your camera, of course and when using the filters it looks daft. It was highly amusing putting the 100mm holder on the Pen-F and clearly it was not meant to be. What comes next? I've used Formatt filters for a few years now with my Cokin P holder (85mm if your interested in sizing) and found the filters required little or no colour correction in post production so I was reluctant to loose this quality. My answer lay with the traditional Formatt Hitech holders. Cast metal very similar in style to Lee and many other holders, Formatt sell a 67mm holder and filters set, tiny in size and price but still the same quality. Common questions I get asked & here are the answers. A slight problem but one that is very easy to overcome, when shooting with the M.Zuiko 12-40mm f/2.8 pro lens, wide open at 12mm I clip the edges of the holder by a tiny fraction so I do get some vignetting BUT it is very small that the clone or heal brush does it in one click. Some subjects you don't even notice the clipping. Does Formatt Hitech filters work with fisheye lens or the 7-14mm pro lens, afraid not and you will find most filters won't work with these lens due to the glass on the front of the fisheye extruding out. I only know of Nisi who offer an adapter that fits over these lens but this is for a 150mm filter kit and is very expensive. The adapter alone is £130. Colourcast & Do I buy resin or firecrest? Resin is plastic and Firecrest are glass. Firecrest have next to NO colour casting. Resin are a little more susceptible to colour cast but from personal experience, I have no had this issue and if you set a custom white balance you will have no issues. However when you don't you can actually get some magical effects! Below is an example of what can happen with the wrong white balance and when you set it correctly. 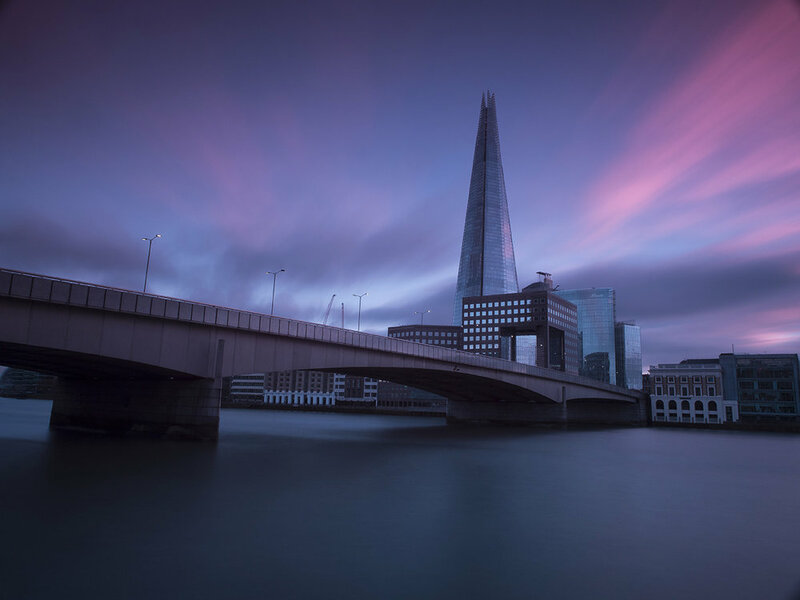 Taken from a recent trip in London using the 10 stop ND, 3 stop grad and FC polariser - Olympus Pen-F, tripod, ISO-200, f/13, 60 seconds. What filter set do I use if I'm not M4/3? As explained above, M4/3 is ideal with the 67mm holder and even pushing into the 85mm range. Smaller APS-C and larger mirrorless cameras you'll need the 85mm at minimum but if in doubt just got 100mm and to save money I would go down the 100mm Firecrest holder. Everyone I have recommended this holder too has loved the product. If you are new too filters, do be aware of the prices. They do jump considerably from size to size. For example, a 67mm 10 stop ND is between £20-60 a 100mm is £90-130 so do be prepared to spend a fair bit on your filters but the rewards are well worth the investment and if you treat them with care you will get years of life out of them. For peace of mind, I have dropped my Hitech system numerous times on paths, sand and rocks and the front screws help protect the glass. Not a scratch. So they can take some beating before they crack, although please don't try this at home! Nor blame me if you do manage to break them. Thank you for reading and if you need any further advice on filters for photography, feel free to ask or Tweet me.